CSR — GOLDEN ABC INC.
Side by side its business goals, GOLDEN ABC, along with its employees, actively fulfills responsive stewardship. Through its Corporate Social Responsibility platform called GET UP, the company advocates arts & culture, education, environment, and community building. Get Up has been recognized by the Philippine Quill Awards for CSR Excellence and the Asia-Pacific Tambuli Awards for Best Integrated Digital Program for its public launch. It is also included in the company's People Program of the Year Award given by the People Management Association of the Philippines (PMAP). To cap off an amazing year, GOLDEN ABC gets up, gives back, and brings joy and laughter to 300 kids closest to our hearts and our home. Lookin' good, feelin' great. Fuelling passion with fashion! Golden ABC glams up these young musicians as they all-out perform internationally to showcase their talents, reach for their dreams and make our country proud. Godspeed and safe travels to all the members of the Orchestra of the Filipino Youth and our partners from Ang Misyon Inc.
Golden ABC and Museo Pambata have further solidified our partnership through GABC’s support of the Pagbasa at Pag-asa Children’s Reading Center. The program aims to conduct close to 100 reading and crafts sessions over a span of 10 months to various children in underserved communities, and hopefully instill in them an interest in reading and a love for learning. Golden ABC Chairman and CEO Bernie Liu met with Museo Pambata President Nina Lim-Yuson at the Golden ABC Corporate Office. In the photo they are joined by (L-R) Maricel Montero (Museo Pambata Executive Director), Ted Belza Jr (GABC VP for Human Capital Management), and Bryan Liu (E-Commerce and Business Transformation Office Manager). The partnership between Golden ABC and Museo Pambata was formally sealed by Ms. Nina Lim-Yuson and Mr. Ted Belza Jr.
Golden ABC also donated the uniforms for all Museo Pambata officers and staff. MAKE A DIFFERENCE. Fashion with a conscience. 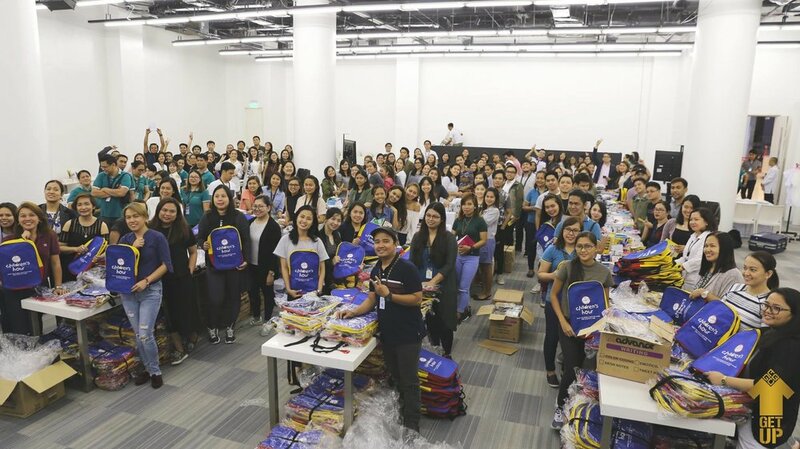 As One Team GABC, our employees were able to repack and complete, in one meaningful and fun-filled evening, 2,000 school kits that will be donated to the afflicted children of Marawi. We continue to GET UP for education through our solid partnership with Children's Hour. Golden ABC has been GETting UP for underprivileged Filipino children through its partnership with Children's Hour Philippines. The annual fund raising campaign is a collective effort made possible through the generosity of all our employees, with the valuable support of our vendor partners. Since 2004, we have raised over 13.1 million pesos. This year's donation by the Golden ABC family was formally turned over by VP for Human Capital Management Ted Belza, Jr. and HRAD Director Jovie Anne Monsalud, and received by Children’s Hour Philippines Executive Director Gennett Garcia and the CH team. Last November 20, 2017, we officially turned over the GOLDEN ABC - Gawad Kalinga Village to our 36 beneficiaries from the Munting Pamayanan PWD (Persons With Disabilities) Community in Escopa III Quezon City. When we celebrated our company’s 30th year, we wanted to mark it with a tangible and meaningful legacy by helping out a community and chose to once again partner with Gawad Kalinga. We commenced groundbreaking in July 2016 and haven’t looked back since. For more than a year, almost every other Saturday, our employee volunteers worked hand in hand with the community to build. The 36 houses are a result of 1,240 volunteers generously devoting 10,184 man-hours on site. This is what Golden ABC gets up for, a community built together through partnership, with love, and a common goal of uplifting the lives of more Filipino people. CALABANGA, CAMARINES SUR | Golden ABC, in partnership with AGAPP Foundation Inc., donated Silid Pangarap classrooms to the poorest barangay in Bicol. The Blessing and Turnover at the Punta Elementery School in Punta Tarawal, Calabanga, Camarines Sur was graced by the Honorable Vice President, Leni Robredo who also hails from the Bicol province. GOLDEN ABC is truly honored to be part of this milestone as we continue to Get Up for Education. 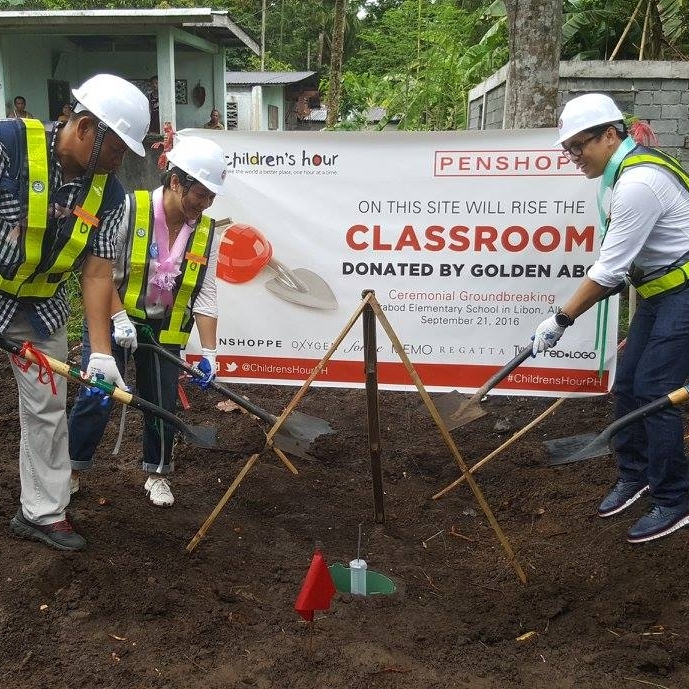 LIBON, ALBAY | In September 2016, Golden ABC had a Groundbreaking Ceremony for a classroom it’s donating to the Burabod Elementary School in Libon, Albay in partnership with Children’s Hour. The new classroom that will benefit 373 students, will include students' chairs, tables, chalk boards, and wall fans. This donation was made possible through the contributions of Golden ABC Employees and business partners through the Children's Hour One Hour campaign project. We will continue to make a positive impact, together we can make GREAT things happen. Dios Mabalos!